There's not much showing in my garden right now. By not much, I mean any of my wildflower loves, but there are a few delightful non natives that have been in the garden since it's earliest days. Like the golden yellow daffodils that came with the yard. I've added more over the years and I'll have them in bloom until the temperatures soar into the 80s! The rivers of Crocus tommasinianus that I planted every year have been eaten by hungry chipmunks and voles/mice. Mr I Don't Garden says I don't get to complain since I have invited wildlife into the garden. He's right, I do have a very welcoming sign posted in the front garden, but that doesn't mean, I want them to eat all my plants! But, being a non-gardener, he doesn't understand how brokenhearted a gardener can feel when she waits all year to see crocus blooms on chilly winter days and instead of a river of the thousands she's planted there are less than a dozen. I know you all understand. Did I say there were no native wildflowers blooming. How could I forget, Hamamelis vernalis! She's still in bloom. I do love this beauty. It has the loveliest small orange/yellow/reddish crepe paper streaming petals that furl and unfurl as the temperature falls and rises. They perfume the garden with their sweet clove vanilla scent on warm days. 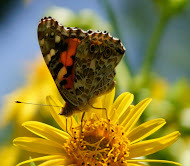 I planted them for the earliest visiting pollinators and for that unforgettable fragrance. Once you smell them, you will, want them in your garden, too. I love that not only do winter blooming shrubs and trees flower for months, they almost always have some fragrance. How clever of Mother Nature to give winter bloomers that something special to insure that a little fly, gnat or bee will follow the scent and pollinate the flower. Hamamelis x intermedia 'Diane' is also in bloom. She's unfurled her spidery crepe paper petals like solar collectors. and they're in full sun receivership, waiting for any early pollinating visitors. Even the marcescence leaves do not detract from her red flowers against the nice blue winter sky. There's speculation that the leaves that cling (until after the last flower petal folds up for the season) actually help protect the blooms from foraging mammals, but, I wonder if they might protect the delicate looking flowers from the bitter cold winds that often arrive when they begin to bloom. In a few weeks the earliest spring ephemerals will be shining heralds of spring's arrival and I will be back on GBBD to share them. In the meantime, head over to May Dreams Gardens to see lots of other posts celebrating blooms. So sorry about your crocus but the witch hazels are spectacular! I'm glad those rascally chipmunks left you at least some! I understand completely about your crocus and am glad to see you still have some lovely blooms. Your Witch Hazel is a lovely addition to your winter garden and it is wonderful to see those bright yellow blooms! Happy Bloom Day! Beautiful crocus! Sorry the river of blooms has dwindled to a trickle. I think it was voles that ate mine. I agree. Wildlife are welcome, but please don't eat the plants! 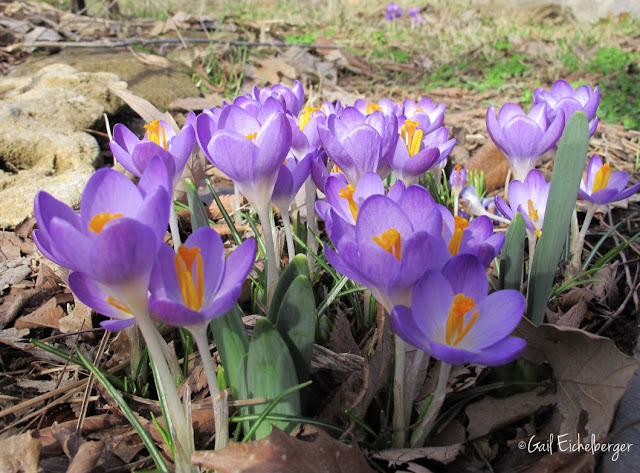 I love to see the crocuses kick off the year in the garden. Thanks for sharing yours with us for bloom day. Wow you have beautiful blooms in your garden at this time of year! When we made our gardens in 1973 we planted 200 tulip bulbs. When nothing bloomed the next spring, we started digging and found nothing. I learned about all those nasty critters that destroy gardens and after 45 years here the problem has only gotten worse. Only gardeners can understand the frustration. I always enjoy seeing what is blooming in your garden Gail. It means to me that in about two weeks the same will be happening here. :) Those pesky squirrels. If they just weren't so destructive. Happy GBBD. I planted a little native witch hazel (in the DC area) about four years ago and it's grown steadily but still hasn't bloomed. How long did it take for yours to mature and set out flowers? Snowdrops are usually left alone and bloom earlier--but they're not crocuses. And Siberian squills bloom a little later. I'm not sure if they are rodent food or not. It seems like there should be some early spring flower you can enjoy! Gorgeous blooms, Gail! I expect to see signs of the spring-flowering bulbs here in the next week or so, with highs in the 50s and 60s (highly unusual). I love Crocuses, too. I have a few close to the house near some Daffodils. They bring such joy. So right! We invite wildlife in but they don't follow the "rules." My crocus never bloom like that, though, so I dearly appreciate the ones you have left. And wow on witch hazel! 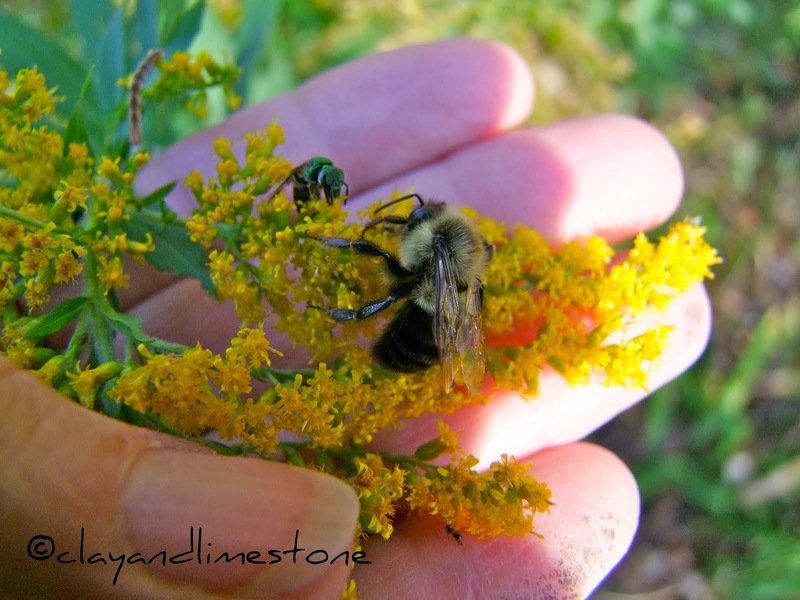 I do love our gardens that feed the pollinators (and "those others") even in winter. Always so nice to know what you're doing! Are those crocus the ones whose anthers are made into saffron? That color is so beautiful. No, those are fall blooming ones. Crocus sativus if you want to find them online. 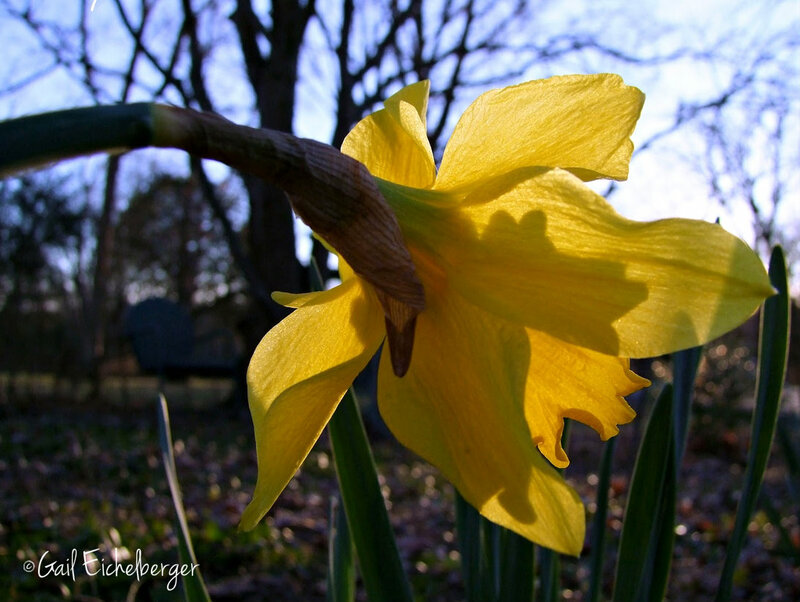 Such a treat to see these spring bloomers, Gail! Even though it's been warmer than usual here, I still haven't seen any signs of anything ready to bloom in my garden. So sorry about your crocuses. I planted a bunch more last fall in squirrel territory, so I'm anxious to see how many of them survived. I have come to think of squirrels and chipmunks like I do my dog. She's an adorable affectionate pup, who of course can't help but find trouble. Even when I'm mad, I'm still laughing inside. She wouldn't be who she is without secretly stealing tomatoes off the counter and me thinking I have lost my marbles until I later find a seed trail. The Squirrels, those troublesome scamps, do get frustrating, but I forgive them every time I see the scamper up my sunflowers and ride them down to the ground like a see-saw. Or climb into the the pumpkins I've left out for them, and fling seed shells out. Then there is that crafty little chipmunk who managed to hide in plain sight from my dog, by climbing up a wall and playing statue just above her head. I can't help but love all those mischievous rascals. Actually, that's not a bad Bloom Day haul for February!